t’s a wonder why this dish is associated with the ‘devil’, when in reality it is actually an angel in disguise. Super easy to rustle up, this recipe can save anyone’s day – from midnight hunger pangs, mid meal snacking to entertaining unannounced guests, it is a foolproof dish that can be made even by amateur cooks, if not kids, and all in a matter of a few minutes. Devilled eggs are known by many monikers – picnic eggs, egg mimosa, and Russian eggs, to name a few. What makes it extremely popular is the creamy filling with which the boiled eggs are stuffed with. After all, who can say no to eggs and mayonnaise? It is a combination hard to resist. And you just can’t go wrong when it comes to making it because it is that simple and requires just about three ingredients to dish it out on your own. 1. Neatly slice the eggs in halves, and then scoop out the yolks. 2. In a mixing bowl, add the yolks, mayonnaise and mustard sauce and mix well. Add salt and pepper accordingly to your taste. 3. Take a piping bag fit with a nozzle, and fill in up with the egg mixture. 4. Carefully fill up the egg whites with the egg mixture, making neat swirls. Serve immediately. Additions: You can top the eggs with chopped herbs such as parsley or coriander, or even oregano and chilli flakes. 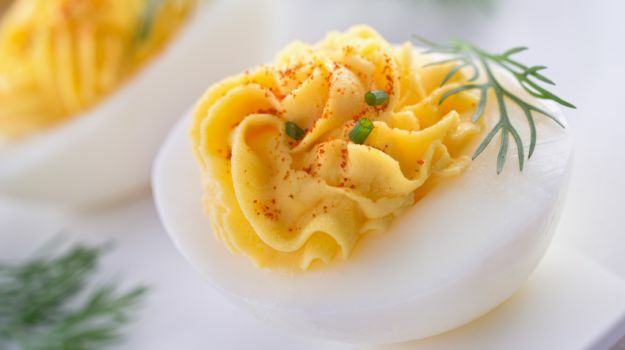 Even though Devilled Eggs are extremely popular in America, the recipe is said to have been taken from the Romans. Apparently, the Romans included it as the first course of anelaborate meal. Over the years, there have been many variations to the dish, where people have experimented with the ingredients that go in the filling. While mayonnaise and mustard remain constant, some of the additions include Tabasco, Worcestershire sauce, chives, spring onions, oregano, sour cream, and caviar, among others to spruce up the flavour. It really depends on your taste, and what’s available in your kitchen store cupboard. You can even give it an Indian spin by adding red chilli powder or garam masala. Or leftover curry to tune up the flavour quotient. It is really that simple! For some added crunch, you can add in chopped onions. I usually like to add in some chopped red, yellow and green bell peppers to give it a dramatic appeal of colours. It also helps in adding to the crunch. Nuts like pecan or almonds would also go well in this recipe. You can finish off with a topping of fresh herbs or microgreens for that extra punch. Really, there’s plenty you could do with this simple dish. So are you up for it?